For over a decade, conceptual and performance art has been dominated by participatory art. Its champions, such as French curator Nicolas Bourriaud (who invented the term "relational aesthetics" to describe it) and American art historian Grant Kester, believe that by encouraging an audience to join in, the artist can promote new emancipatory social relations. 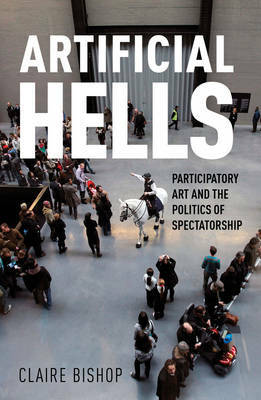 Artificial Hells is the first historical and theoretical overview of socially engaged participatory art. The book follows the trajectory of twentieth-century art and examines key moments in the development of the participatory aesthetic, in both Europe and America. This itinerary takes in Futurism, Dada, Situationism, Czechoslovakian Happenings, and Argentinean Conceptualism, and concludes with contemporary artists such as Thomas Hirschhorn, Tania Bruguera and Jeremy Deller. Since her controversial essay in Artforum in 2006, Claire Bishop has been one of the few to expose the political and aesthetic limitations of this work. In Artificial Hells she not only scrutinizes the claims for democracy and emancipation that the artists and critics make for the work, but also questions the turn to ethical (rather than artistic) criteria invited by such participatory and collaborative art.